On the February 25 edition of MSNBC’s AM Joy, host Joy Reid moderated a segment about the NRA, digging into the callous attacks the NRA has made against the Parkland students who are demanding gun control. Reid and her panel had a merry time belittling the NRA’s most visible spokesperson of late, political soldier of fortune Dana Loesch. To put a period on the point that the NRA is behind the times, Reid shared an ad featuring Loesch pitching her new show on NRA TV as a program that will challenge media giants. The panel called the NRA format “so ’90s” and rightfully pointed out that NRA TV isn’t likely to make a big splash on social media. But there’s something very important missing from this analysis. NRA TV isn’t targeting the mainstream. 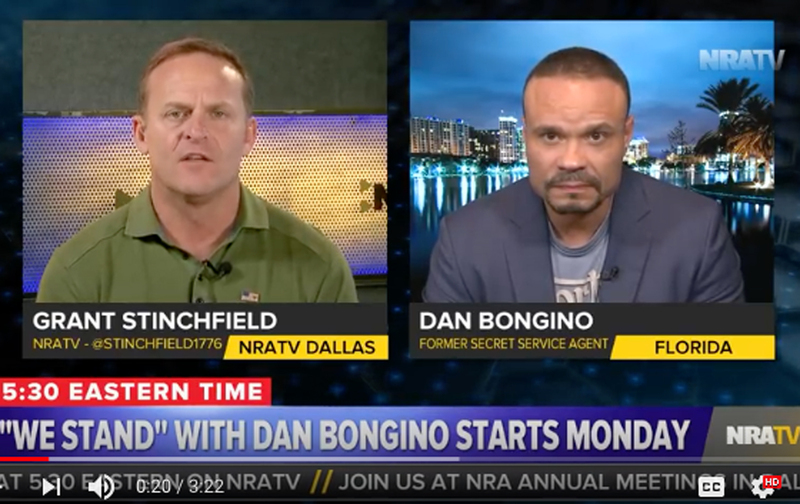 No, NRA TV is directly speaking to the group Donald Trump referred to as “Second Amendment people” in a campaign speech many read as an incitement to violent action from gun advocates if the election were “rigged” and Hillary Clinton won. Trump’s “Second Amendment people” include the Patriot Movement, a network made up of groups like the Bundy bunch that famously staged a 41-day armed occupation of the Malheur County Wildlife Refuge in Burns, Oregon, in January 2016. The animating, radicalizing core ideology of that movement is violent white nationalism. NRA TV ideologically trains these front-line troops, which many believe will only grow more dangerous as the Trump presidency continues, particularly if he is perceived to be under attack, scandalized, and humiliated. That’s no joke. Trump is like a fetish object for far right, whose rage is not really animated by corrupt banks, failing government, the rise of the 1 percent, and globalization. These forces may create the underlying conditions for the rise of radical movements, but what animates movements on the right—the demons that drive them to action and keep them tucked into Trumpist foolishness—is their hatred of people like us. We are the targets of their rage specifically because they’re losing cultural currency as we grow in cultural influence. We have become proxies for all of the ills of society. For these radical elements of the white-identity movement, the stockpiling of guns is one way of signaling in-group belonging, their commitment to the past in a world where they are losing the future, and, of course, their possession of the ultimate tools of the bully. But don’t underestimate the right. Yeah, the NRA may well be out of touch with the mainstream. But what the far right generally, and the NRA in particular, is very good at is manipulating the Overton Window. By organizing and training the most active and extreme elements of the right, the NRA capitalizes on the radicalizing effect of the arguments made by that part of the movement. The Overton Window is what public-policy advocates often use to frame the viable range of ideas in political discourse, while excluding what is considered too extreme. But the window isn’t static. Extremists can stretch the limits of what is acceptable and push political debates to the right when the political climate is ripe for change, as is the case right now. In the 1980s, religious right-wing groups employed debate coaches to teach evangelical youth how to engage in the abortion debate in order to push the debate over abortion to the right. NRA TV is an updated version of the same tactic that attempts to drive Second Amendment panic. Scot NakagawaScot Nakagawa, a senior partner at ChangeLab, is a community organizer, activist, cultural worker, and political writer.